We showed that bone microenvironment (osteoblasts) is a source of S1P and can promote cell proliferation and survival of cancer cells. 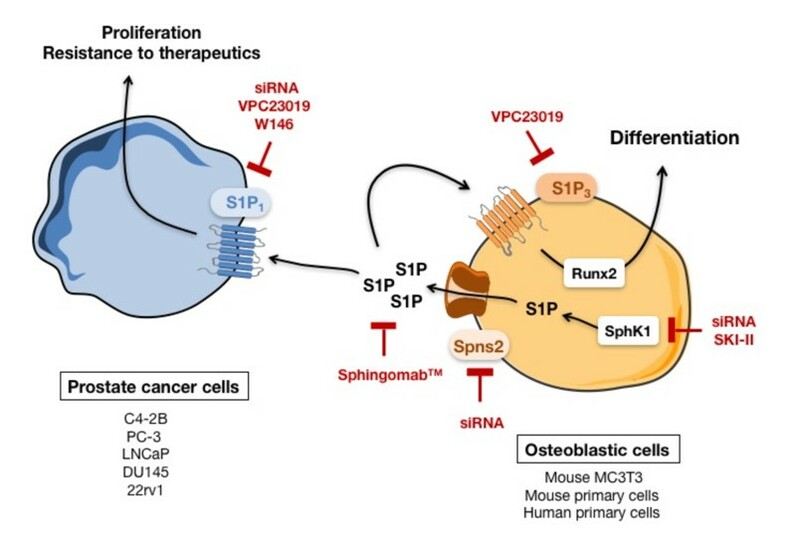 S1P-borne osteoblast stimulates proliferation of metastatic prostate cancer cells and protects them from conventional therapeutics (chemotherapy and radiotherapy). S1P receptor subtype 1 (S1P1) expressed on prostate cancer is important for cancer cell responses to the S1P secreted by osteoblastic cells. S1P has a dominant effect as a paracrine growth factor as a substantial inhibition of osteoblast-derived effects are negated by interferring with S1P signaling. Left Panel, basal SphK1 activity was quantified in various cancer cell lines (prostate, breast, lung, pancreas, neuroblastoma, leukemia), in non-differentiated osteoblastic MC3T3 cells and primary osteoblasts from mouse calvaria (mOB) or primary human femoral head osteoblastic cells (hOB). Right panel, S1P levels were quantified in media from C4-2B and PC-3 prostate cancer cells, from non-differentiated osteoblastic MC3T3 cells and primary mouse calvaria osteoblastic cells (mOB) or from primary human femoral head osteoblastic cells (hOB). In the bone microenvironment, prostate cancer cells produce factors that promote the growth and differentiation of osteoblastic cells into mature osteoblasts, which in turn further stimulate prostate cancer cell growth. It is important to note that we showed that SphK1/S1P signaling is critical during differentiation to mature osteoblasts, notably by regulating Runx2 level, a key transcription factor involved in osteoblastic maturation. the interactions between prostate cancer cells and aspects of the bone microenvironment may hold the key to preventing the development of bone metastases or resensitize to therapeutics, and S1P may be a candidate as a target in the treatment of prostate cancer bone metastasis.